It was in 2007 when my parents had to apply for my student Schengen visa. It wasn’t easy back then, especially with my case since I was underage and my parents had to give my sister the rights to be my guardian while I live with her in Finland, there was too much fuss and tons of paperwork. Of course, I didn’t process my own papers because I was not yet eighteen, therefore my parent’s had to endure all the processing themselves while I tagged along. That was eight years ago. Nowadays I have to do all the visa processing all by myself without anyone’s help and although year by year visa application becomes more expensive, yet easy (thanks internet), there is one thing I realize has not changed: the process of application itself. Throughout my eight years of stay in Finland, I had to go through the same visa application process every year for four years until I finished my studies. After that, I had to apply for a four-year working resident visa. It doesn’t matter in which country you try to apply for your Schengen visa (may it be student, tourist or working visa) and/or to what country, the requirements are very standard (we’ll go through them as you read along). But as always, every embassy requires some specifics. That is why it is always better to call and ask for other special requirements needed just in case it is not clearly specified in their list online. Although I acquired my Schengen visa because of work and studies, that does not mean it is so much different than applying for a tourist visa. Tourist Schengen visas, however, is a much simpler process than work and studies since it is only meant for short visits (90 days). Be aware nonetheless because even though I say it’s simpler doesn’t mean you have to treat your application lightly. One wrong move will lead to your application getting denied and although reapplication is possible, it is still better to be careful and triple check your requirements before handing it to the embassy or consulate for processing. Like any visa application, it also costs a lot, so please take care that you fill in every detail correctly. If your country of nationality is on the list, you need to apply for a visa in order to visit one or more Schengen countries. It is very important that you have copies of all the documents required! Ticket reservation, a round trip ticket is required for the application. But please do not buy a non-refundable ticket! Reservation is possible and you can cancel it anytime. Anything can happen. -A formal invitation letter. Make them write this one as detailed as possible stating that they are inviting you to their home with warm welcoming hearts. Make sure they signed it with their names in capitals with signatures and dates! If they want, they can also write in their contact numbers and address for more paperwork for the embassy. *Depending on the country and embassy you are applying, there might be extra requirements needed to prove your relative/friend’s residency. So please call in and ask! -Any papers you can think of that states your financial security during your travels will strengthen your application. I always add extras like this, just to be sure. I even handed them a copy of my savings account. It’s not necessary but it could help. “The travel medical insurance policy is to be secured, covering any medical emergency with hospital care and travel back to one’s native country due to medical motives. This health insurance policy has to cover expenses up to 30,000 euros, the sum depending on the residing days, and also it has to be valid in all Schengen countries. The health insurance policy must be purchased before picking up the visa and if your visa is refused you can cancel it!” Here’s the Travel Insurance that we personally use. Schedule an appointment and make sure you have a copy or proof that you have that appointment! Some embassies require that specific paper for some reason. In some cases, they call you in for an interview so prepare for that as well. Bring cash with you! Most embassies I’ve encountered only take in cash. Usually, they do not have change as well, for some reason. So bring some extra change with you or better yet, bring in the exact amount you need to pay the visa plus some extra for some extra shenanigans they might ask. You’ll never know. But then again, when you call in, ask for that as well! When you hand in your application personally during your appointment, make sure that you show them both originals and copies of your papers. Remember: They do not give back your papers once you hand it in! They take copies only so make sure you have copies of ALL the papers you have. Some embassies do not copy for you so if you have one paper that does not have a copy, you might need to come back. In case you are called in for an interview do not fret! They usually call in if there is something missing or they have something to clear out. In this case, all you have to do is clear things out with them while you are in that interview. No need to panic if you have nothing to hide. Where to submit the application? Once you have completed the requirements and you’re ready to hand in your application, it is very important to identify which embassy or consulate you have to give it in. If you are going to visit only one country, for example, you intend to visit France, then you have to apply through the French embassy in your home country or country of residence. However, if you are going to travel to more than one country during your travel be aware that you need to outline your itinerary and have to apply through the embassy of the country to where you will spend most days of your travels. For example, if your itinerary is outlined and you are going to visit France and Italy during your travels and your entry and exit are France but you will be in Italy one day longer than your stay in France, you would still need to apply for your visa through the Italian Embassy. So take these into consideration when you plan your trip. Related Article: Here’s the list of cheap hostels in Metro Manila. 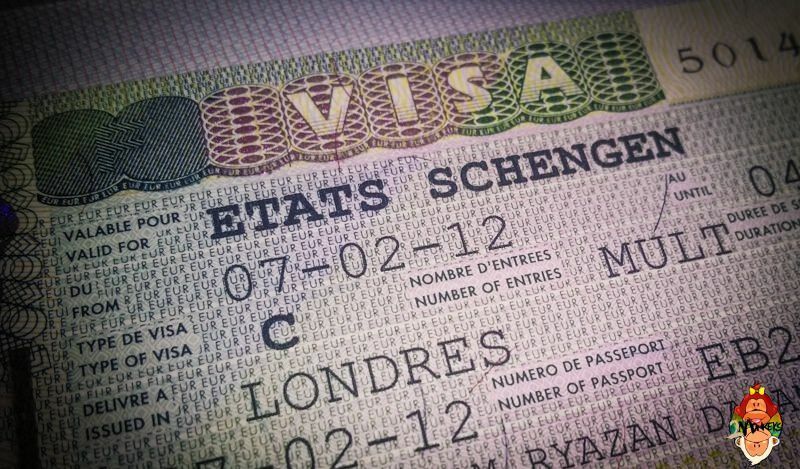 How much is the Schengen visa fee? Depending on the exchange rate between Euros and your local currency, it can change from time to time. Also take note that once you paid for your visa it is non-refundable! Also, make sure that when you call in for further advice in any embassy you intend to apply, ask as well if they have any extra fees you need to pay. Another tip I can give from what I’ve learned from the past is that they usually only take in cash and when you pay them, it has to be the exact amount! So bring in some change or the exact bill in cash! It is normally valid for 90 days (not more). If you intend to travel to more than one country during your stay or you plan to travel in and out of the Schengen zone make sure to fill in the “multiple entry” gap in the application form. The visa is valid for six (6) months so if you are granted multiple entry visa that means you can be in and out of Schengen zone for 90 days within 6 months. How long till you get the visa? This highly depends upon many things and no embassies would promise you anything that is why it is advised to give enough time to the processing of your visa. For me as I remembered it took nearly two months, but that’s because I was applying for student visa. For my sister, it took some time because when she passed her application, the lady who handled her application accidentally ripped her passport that caused a major delay. From my research from other people who applied for it, it took them about 10-15 days after they passed their application. In Dubai, for some Filipino citizens with local residency, it took only less than 10 days and they applied through the Swiss embassy. Again, plan ahead and be sure to give enough time while applying for the visa! On peak seasons Schengen countries receive a lot of tourists and that means tons of visa applications to different embassies. Take that in consideration too! It is very important that you hand in your application with complete requirements for no further delay. How much is the risk of my application getting denied? First of all, no embassies would promise any approval until everything is checked out. Therefore just because you have completed all requirements does not give you a full guarantee that you will be granted a visa. The risk is always there but it is always good to think positive! I have not heard anyone who got denied a Schengen visa so far and what I’ve researched online those who got denied did minor mistakes in their application i.e. not paying attention when making the itinerary and applying to the ‘wrong’ embassy. So be aware that they do check everything so again, check your application and requirements thoroughly and if everything seems fine it should be good. Also, this is why planning your application ahead of time is a major plus in case of catastrophe of getting denied happens, you can reapply as soon as possible.